The Vanished Pantheon was released in 2005 by a Finnish label Firedoom music. Even though it was definitely one of the best releases of 2005, it was perhaps too odd and distant for most Finns to understand. It stands as only the 3rd release of the Brazilian Mythological Cold Towers, found in 1994. Their first two releases were received with quite indifferent reviews. The first, Sphere of Nebaddon got more positive publicity, but for me the second, Remoti Meridiani Hymni is stronger of the two. However neither of the first two albums become even close to the 3rd release. 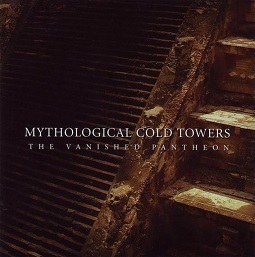 It seems Mythological Cold Towers really found themselves on The Vanished Pantheon. Massive doom metal accompanied with a feel of mythic remote civilizations, and old cultures getting grinded to the dust. The gigantic atmosphere sometimes slips to being humorously overdramatic. But if you have a personality that can appreciate extremely dramatic compositions (à la Bal-Sagoth) you should find this a very interesting release. Quite raw and unpolished, yet very natural sounds fit Vanished Pantheon perfectly and give a lot of primeval power to the compositions. The sounds remind me of Keep Of Kalessin’s Kolossus, but unlike KOK, Mythological Cold Towers succeeds in having lots of strength and rage within a natural sound. Mythological Cold Towers already released their 4th album Immemorial in October on the German label Cyclone Empire. I sincerely hope that The Vanished Pantheon wasn’t just a one album miracle.